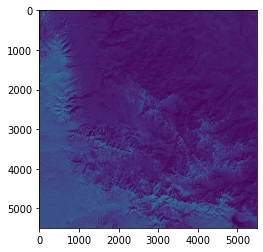 This example notebook shows how to obtain Sentinel-2 imagery and additional data from AWS S3 storage buckets. The data at AWS is the same as original S-2 data provided by ESA. The sentinelhub package supports obtaining data by specifying products or by specifying tiles. It can download data either to the same file structure as it is at AWS or it can download data into original .SAFE file structure introduced by ESA. Before testing any of the examples below please check Configuration paragraph for details about configuring AWS credentials and information about charges. Note: matplotlib is not a dependecy of sentinelhub and is used in these examples for visualizations. From obtained WFS iterator we can extract info which uniquely defines each tile. Once we have found correct tiles or products we can download them and explore the data. Sentinel-2 tile can be uniquely defined either with ESA tile ID (e.g. L1C_T01WCV_A012011_20171010T003615) or with tile name (e.g. T38TML or 38TML), sensing time and AWS index. The AWS index is the last number in tile AWS path (e.g. https://roda.sentinel-hub.com/sentinel-s2-l1c/tiles/1/C/CV/2017/1/14/0/ → 0). Now we are ready to download the data. Let’s download only bands B8A and B10, meta data files tileInfo.json, preview.jp2 and pre-calculated cloud mask qi/MSK_CLOUDS_B00. We will save everything into folder ./AwsData. Note that upon calling this method again the data won’t be re-downloaded unless we set the parameter redownload=True. Download and reading could also be done in a single call request.get_data(save_data=True). If bands parameter is not defined all bands will be downloaded. If metafiles parameter is not defined no additional metadata files will be downloaded. The data can also be downloaded into .SAFE structure by specifying safe_format=True. The following code will download data from upper example again because now data will be stored in different folder structure. Older products contain multiple tiles. In case would like to download only some tiles it is also possible to specify a list of tiles to download.